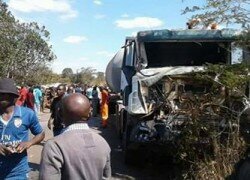 TWELVE people yesterday died on the spot after the minibus they were travelling in to Kasempa collided with a truck that was coming from the opposite direction. Confirming the incident to the Daily Nation, North Western Province Commissioner of Police Lackson Sakala said the accident happened around 14:30 hours at Mutanda Secondary School junction. He said the vehicles involved in the accident were a Toyota Hiace mini bus and a Volvo truck belonging to First Quantum Minerals Limited. Mr Sakala said the minibus was coming from Solwezi heading to Kasempa with 17 passengers on board when the accident happened. He explained that due to excessive speeding, the driver of the minibus lost control after a rear tyre burst and veered into the opposite lane, leading to the collision with the truck. ” Yes, we had a fatal accident this afternoon. Twelve people died on the spot, five females, six males and one male juvenile,”Mr Sakala said. He said the other seven passengers sustained multiple injuries and were admitted to Solwezi General Hospital.